Female Sheargrubs (ウジンコ♀?, lit. : "Parrot Maggot ♀") are enemies found in the Pikmin games. Unlike the members of the opposing gender, they are scavengers and do not attack leaders or Pikmin, although they still chase them. Their behavior, along with their light pink color and relatively small jaws, is the most distinctive difference between males and females of the species. As with Male Sheargrubs, however, they eat bridges that were built on a previous day. They provide only one or two seeds, and thus are usually not worth bringing back to the Onion. In Pikmin 3, Female Sheargrubs regenerate health when they are underground, just like Male Sheargrubs. They can fully heal themselves in 30 seconds. When their health is at 20% or lower, they will return to their nest to bury and recover, and when they regenerate to 50%, they emerge and continue their chase, if there are leaders or Pikmin nearby. The health wheel will always be visible above the ground when they are recovering health. Female Sheargrubs are harmless pests and can be defeated with ease by either the Pikmin or a leader's punches; there is no threat at all. A single Pikmin on their backs should take them out instantly. Leading them into water will also deplete their health in Pikmin and Pikmin 2 (this does not work in Pikmin 3). Japanese name: ヒラバヒメアギト?, lit. : "Flat land Princess Jaw"
The Female Sheargrub is the female counterpart to the Male Sheargrub, which naturally explains the "Female" part of the name. The Japanese name is ウジンコ♀?, which contains the Venus symbol to point out that it is a female. In the creature's scientific name, Himeagea mandibulosa, the word mandibulosa is Latin for "mandible". The internal name in Pikmin is kabekuiA. The A in the name is the disambiguation identifier for each mandiblard; the Female Sheargrub has an A, the Male has a B, and the Shearwig has a C. The internal name in Pikmin 2 is simply ujia, with uji being part of the Japanese name, and the a being once again the identifier. Finally, Pikmin 3 follows the same scheme as the previous game, but with the name starting with ujinko_, making its internal name ujinko_a. 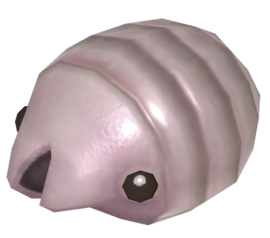 In the GameCube Interactive Multi-Game Demo Disc Version 18, this enemy is referred to as "Shear Grub (Female)", with a space. Male and Female Sheargrubs in the enemy reel of Pikmin. A Female Sheargrub on the Piklopedia. A closeup of a Female Sheargrub in Pikmin 2. The creature's e-card, #44 (11th blue card). A dead Female Sheargrub in Pikmin 3. This page was last edited on April 19, 2019, at 14:09.